Eminently private setting situated on a cul-de-sac and tucked away from the road in the exclusive and premier community of Elysium in Mount Dora. 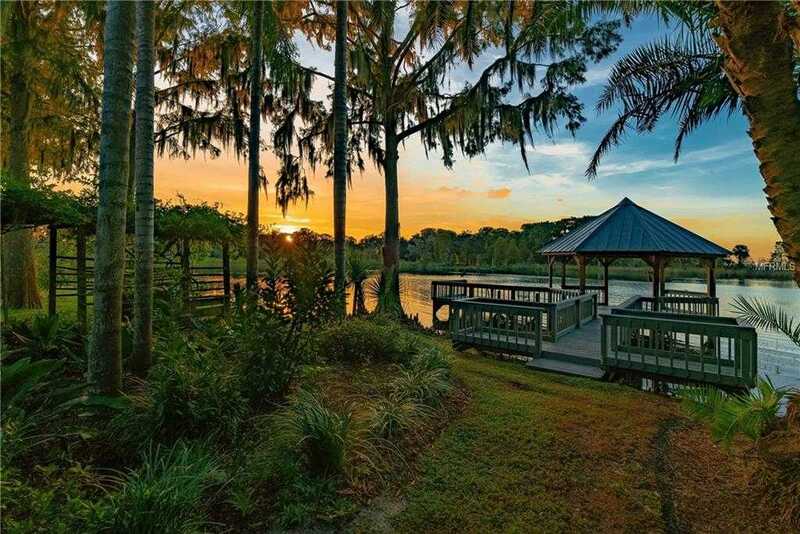 Enjoy glorious sunrises and spectacular sunsets with over 200 feet of direct frontage on Lake Dora with scenic back yard setting, private dock and gazebo. This custom built Jett Riley home is nestled amid the exquisite natural beauty of Florida and showcases breathtaking waterfront views from nearly every single room. The interior is warm and rich and features natural woodwork, reclaimed brick, wood flooring, custom millwork, plastered ceilings and walls and abundance of French doors that open wide to multiple porches and a huge screen enclosed lanai that spans the entire length of the home. A welcoming front porch entry opens to a distinctive floor plan which includes a great room with floor-to-ceiling wood burning brick fireplace, formal dining room, large master suite with front and rear porches and a second bedroom. The large center island kitchen with commanding waterfront views is the centerpiece of the home and connects to the breakfast room with floor to ceiling wood burning fireplace making it perfect for intimate dining or entertaining on a grand scale level. The second level includes a large loft or office with built-in bookcases, Jack and Jill bath and 2 large bedrooms with French doors that open to private balconies. The views from this home are absolutely awesome! Additional Water Information: Nice gazebo with metal roof on the waterfront. Please, send me more information on this property: MLS# O5741719 – $820,000 – 1383 Elysium Blvd, Mount Dora, FL 32757. I would like to schedule a private showing for this property: MLS# O5741719 – $820,000 – 1383 Elysium Blvd, Mount Dora, FL 32757.